Louis Reed celebrates a goal for Chesterfield. Photo: Howard Roe/AHPIX.com. Latest Peterborough United signing Louis Reed wants an immediate return to the Championship. Reed (20) became the eighth summer recruit for Posh when moving to the ABAX Stadium for an undisclosed fee from second tier side Sheffield United yesterday (June 18). Louis Reed after signing for Posh. Photo: Joe Dent/theposh.com. 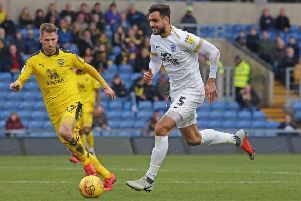 The midfielder spent last season on loan at relegated League Two club Chesterfield so he’s thrilled to have joined one of the favourites for promotion from League One. “I’m delighted to have completed the move,” Reed told the official Posh website. “It’s been going on for a while and now I just want to get back to the Championship. “I enjoyed my time at Sheffield United. They have been good for me, but it’s now the right time for a new start. I know the manager here well. I played against him plenty of times so it will be good to play for him. “I’ve played in a lot of positions so I’m very versatile, but I want to bring goals and assists to the club. I like to think I’m creative in the final third, but I will also help out defensively. Louis Reed (left) in action for Chesterfield. Photo: Howard Roe/AHPIX.com. “It was disappointing to get relegated last season obviously, but there were many positives for me personally. I played a lot of games and got lots of minutes under my belt which is just what I needed. Reed is the youngest player to make a Football League appearance for Sheffield United, appearing at the age of 16 against a Rotherham side managed by current Posh boss Steve Evans in 2014. Evans has followed his career ever since. “Louis is another excellent addition to the group,” Evans stated. “He is a young man I have looked at for three or four years now since he was a kid at Sheffield United. “He made his debut as the youngest ever player to represent Sheffield United against Rotherham United when I was in charge and it’s fair to say that he had a special debut, which led to Nigel Clough playing him in a lot of games in the following two seasons. “As United progressed under Chris Wilder, they’ve gone for more experience and Louis has paid the price. He’s got a huge future and we are delighted to be the team that has been successful in getting him in, considering how many teams in League One were keen to take him.